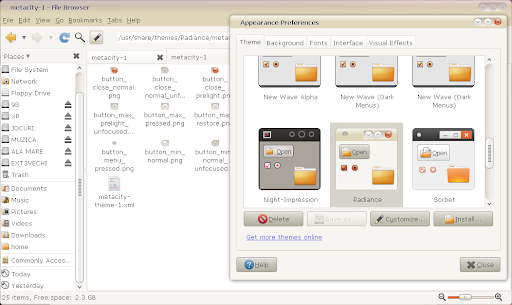 The new Ubuntu "Light" Radiance theme comes with the minimize and maximize buttons inverted. I have edited the original Metacity theme to put them back ("minimize-maximize-close"). To install it, extract the archive and copy all the files to /usr/share/themes/Radiance/metacity-1, overwriting the original files (make a backup first) - note: you must open Nautilus as root for this: enter: "sudo nautilus" in a terminal. Then change the Metacity theme to any other theme and then choose Radiance again to apply the changes (kind of like a restart of the theme). Update: and here is Ambiance fixed too.